For this amazing wedding photo, I thought that I would do something a little different to the norm. I love photographing weddings at night, or at least taking the photos of the couple when the sun has gone down. In order to take this photo I used two of my Profoto B1 photographic studio lights. The first, I placed facing the background and used a red-orange filter in order to add a splash of colour to the trees. The second light, I placed facing the couple and slightly to my left, this time with a bare-bulb which gives a blue-white light. 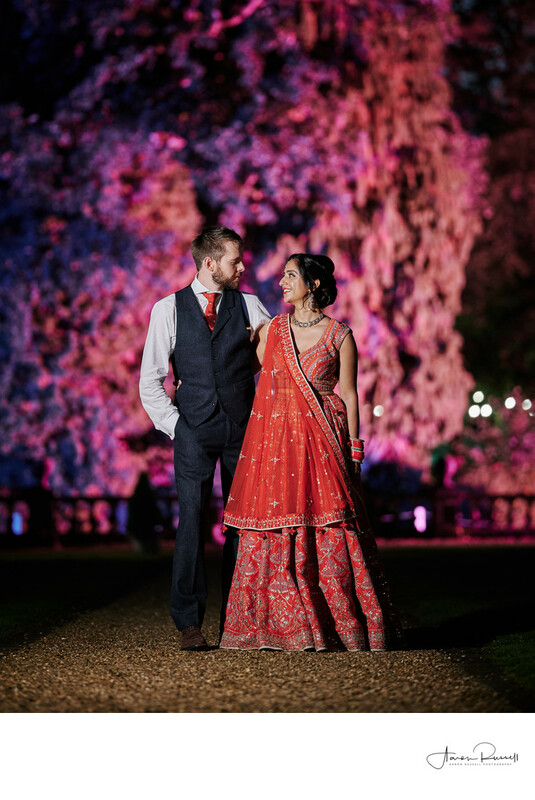 As the light facing the couple is cooler in colour temperature than the one in the background, the image, once correctly white balanced means that you have a well exposed and perfectly balanced image of the couple, with a rich and warm background to juxtapose them against. Getting the correct exposure when using flash at a wedding can be tricky, and situations like this can and will fool automated metering systems both in the flash units themselves and in the camera. In order to get around this, I used a manual exposure, both in the camera and on the flashes. I first set the exposure for the background, and then manually dialled the light facing the couple up and down until the exposure value for the background mixed the couple.